Today we went to Mote Marine ( http://www.mote.org/ ) what an incredible place! Every habitat indigenous to the sub-tropical Atlantic and the gulf of Mexico is represented. the tanks were wonderful with all the life species represented. 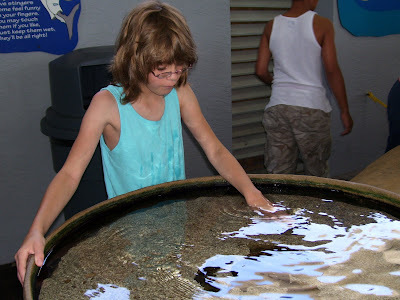 And then there were the "petting pools" where you could reach in and touch the critters. 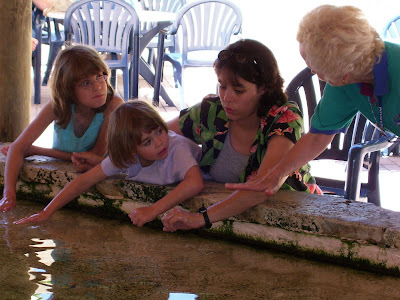 Not to forget the mammal hospital where they rehab the whales,dolphins,manatees and turtles. All in all an unforgettable day. Kara is getting hands on a living sand dollar. And here, we're at the stingray petting pool. They feel just like velvet! And we had our own tour guide with us. Very cool. 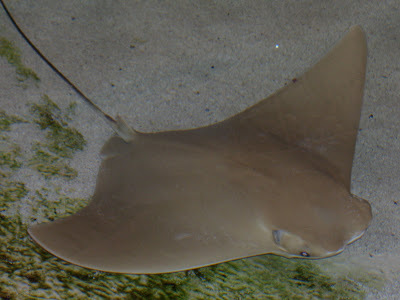 The boys and I used to go to the aquarium in Tampa when we lived there - they always loved going to zoos and aquariums. Sounds like you guys are having a great visit.